The cardiac stress test involves walking on a treadmill or moving belt and will show how your heart works when you are physically active. During the test you will be attached to an Electrocardiogram ( EKG). This will record the electrical activity of your heart. You will also have your blood pressure recorded at regular intervals. The test has many stages, each lasting three minutes. The speed and incline of the treadmill will increase at each stage. 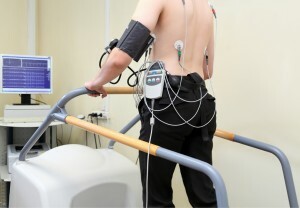 An Exercise Tolerance Test is performed on people who have chest pains or symptoms of angina. A positive result will confirm a diagnosis of coronary artery disease. If the test is positive your cardiologist will then choose the next intervention necessary to confirm the extent of the coronary artery disease. During the test a nurse or medical assistant will monitor your other vital signs, such as breathing and body temperature. Electrode patches will be attached to your body. These patches are connected to the EKG monitor, which will record your heart rate throughout the test. You will then be asked to begin exercising on the treadmill. When your heart rate has increased to a certain level, you will stop and rest. Your heart will continue to be checked until the rate returns to normal. Do not eat, drink or smoke for three hours prior to the test. Wear comfortable shoes and loose clothing. This test can provide valuable information about the condition of your heart. If you experience chest pain or if you recently had a heart attack or heart surgery, the test can confirm how much physical activity your heart can handle or the amount of exercise that is best for you. It can also identify abnormal heart rhythms that occur when you are physically active.